The country is awash in natural gas, but diesel prices are near all-time highs. 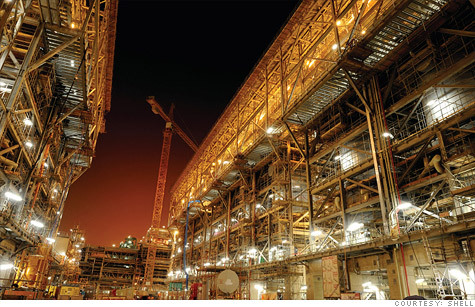 It's possible to make one from the other, like at this Shell plant in Qatar. NEW YORK (CNNMoney) -- Near-record low natural gas prices have hurt the industry, but a technology that can turn cheap gas into more profitable diesel could keep demand high and mitigate the impact of falling costs. A gallon of diesel costs just over $4 a gallon, off the record high of $4.85 hit in 2008. Yet natural gas is around $2.30 per million British thermal units, nearly one-seventh its record of over $15 per million Btu reached in 2008. With prices for natural gas so low, and prices for oil-based fuels so high, the idea of building plants to convert natural gas directly into liquid diesel and jet fuel is something more companies are looking into. "The abundance and affordability of natural gas in the United States provides opportunities to use the fuel in new ways that can enhance our nation's energy diversity and offer environmental and economic benefits," said Kelly op de Weegh, a spokeswoman for Royal Dutch Shell (RDSA). Shell is currently considering building such a plant along the U.S. Gulf Coast. Last September, South African energy firm Sasoil (SSL) said it is considering a similar plant on the Louisiana coast. But both companies will need to weigh their options carefully. Gas-to-liquids plants, as they are known in the industry, cost billions to build. And they need access to cheap natural gas, not only for the 4 or 5 years it takes to construct the facility, but over the 20 or 30 year timeframe the plants would operate. "The one cause of concern is the economics of the industry," Leslie Palti-Guzman, a natural gas analyst at Eurasia Group, wrote in a recent note. The high cost to build a plant, combined with the need for natural gas to stay cheap, could constrain the growth of this emerging fuel source, she said. The U.S. Energy Information Agency says that with oil at $100 a barrel, natural gas needs to be priced below $6 per million British thermal units for the process to be economic. But the price swings in this industry are huge. For example, natural gas has swung from over $15 per million Btu to around $2 now. Oil prices are another big variable -- they were in the $30-a-barrel range as recently as 2009. "How the economics will work is a key driver and one we will continue to evaluate," said Shell's op de Weegh. The technology is quite similar to making liquid fuels out of coal -- a process developed nearly 100 years ago and used heavily by oil-strapped Germany in W.W. II and, later, by South Africa. But it's only recently been applied to natural gas, which results in a fuel that's cleaner than if it's made out of coal. In a very basic description of the process, natural gas, oxygen and water are fed into a reactor, which uses heat, pressure and catalysts to make a wax. The wax can then be upgraded to diesel, jet fuel and a variety of other refined products. An apology to most American motorists: The process cannot easily produce gasoline. But the diesel production might help lower prices for truckers and others that use the fuel. And finding a use for the country's rising natural gas production is essential to avoid a steep slowdown in the natural gas drilling industry, which has generated thousand of well-paying jobs over the last few years. To be sure, the impact on the price of diesel or natural gas is expected to be modest. Eurasia Group lists just over 400,000 barrels a day of production capacity at both proposed and operating gas-to-liquids plants worldwide. EIA says at least 1 million barrels a day would be needed to significantly impact prices. Still, any boost in demand would be welcome for U.S. natural gas producers. Plus, there's always the chance the technology will improve as more plants get built, lowering costs and leading to bigger production amounts. "This is a nascent technology, and breakthroughs can always happen," said Palti-Guzman. "There's room to grow."